Scientists say that if the average temperature of the world's ocean rises by just one degree, the resulting rise in water level will flood coastal cities around the world. (Including New York!) Where will the inhabitants go? 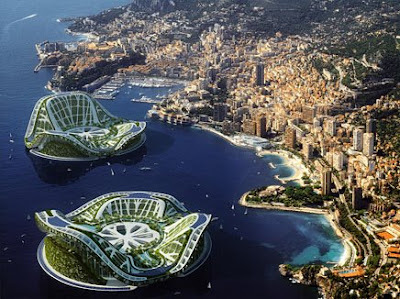 One architect, Vincent Callebaut, has devoted himself to finding a solution. 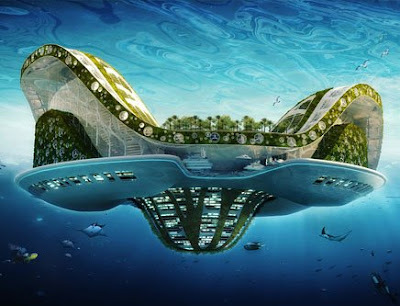 He has designed LILYPAD, an amphibious, self-sustaining city modeled after the round, flat leaves of giant floating lilies. 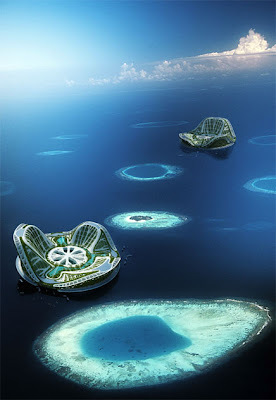 Each LILYPAD could accommodate 50,000 inhabitants. A central lagoon would collect and purify rainwater while the structure's three "mountains" would house facilities for work, shopping, and entertainment. LILYPAD is also designed to be so energy efficient that it would be able to supply energy to nearby countries and cities. It sounds cool and looks even better. But I hope they're never necessary. I'd much rather stay on the island of Manhattan. It'd be sorta like Atlantis before it sunk! If NYC flooding sounds bad, what about the entire state of New Jersey? I heard something about global warming that said we'd be sunk if a tsunami ever hit. And isn't global warming supposed to make more storms come? On the other hand, I wouldn't miss NJ too much if I got to live on a LILYPAD. They have internet connection, right? that is way cool! i hope they're not nessacary but i would totally live on one! Awesome! Of course, Manhattan would be the first to go in that case; I hope we won't have to resort to those islands. They should still buy build them 'cus of the over population of people...and if they're so energy aficient....then why not?!?! Jin Ai: Oh dear. My mother used to do stuff like that to me, too. Except I ended up doing really terrible things like hauling gravel or cleaning toilets. I think I would live there. Flooding not good, though. that's awesome, but it kinda freaks me out that peopele are preparing for global warming to take away all of that. it should be prevented first. Jin ai: Study squirrel (or other wildlife) behavior or something? You'd just have to write what it does and then you can do whatever you want for the rest of the time. Maybe you could even go to a zoo. Whoa, that would be so completely and TOTALLY cool!!!!!! !